I got the recipe from a magazine; I think it was called One Pan Cooking or something like that. Start by lining your muffin pan with paper cups or cooking spray. Then add one or two slices of deli ham to basically create a ham cup. Add cooked corn, a dollop of chopped spinach along with a good helping of cheese. Use fresh from the cob for the best flavor; the corn is probably the strongest flavor in this dish. 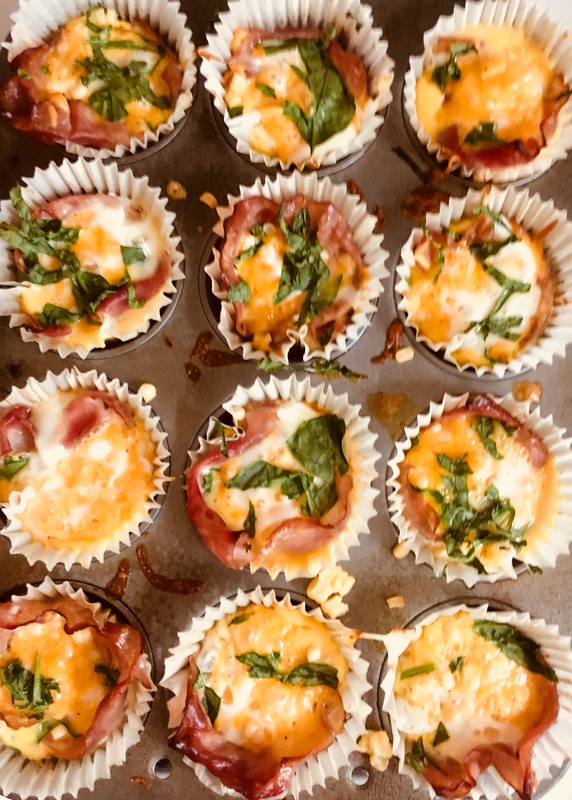 In a separate bowl mix eggs (about two eggs for every three muffins), a dash of milk, spice of your choice, (I like either Italian seasoning or herbs de Provence since they are so easy. But using rosemary or oregano will also work.) Whisk all of this together and pour into each muffin. Bake at 375 for 14-18 minutes, just until the eggs are cooked. Eat after they cool a bit or save them or later. They are good hot, warm and room temperature. I’ll be serving them to my book club this coming Sunday. These look wonderful. I’m going to give them a try just as a dress rehearsal, and then save the recipe for those times when “a little something” is needed, but dessert won’t do. If they are good enough for your book club they will be good enough for mine. Thanks!